Building your own picnic table bench seating can be a fun weekend project for the amateur woodworker. Here is a complete materials list and instructions that you can use to undertake this project. Two top slats- 2" x 6" x 72"
Four legs- 2" x 4" x 17 ½ "
Eight cross braces- 2" x 4" x 10 ½"
Bench stretcher- 2" x 4" x 48"
Brass wood screws #12 x 3"
Consider using red or white cedar when purchasing the lumber for this project. Cedar is naturally resistant to insects, decay and weather damage. White cedar, when left outdoors untreated, weathers naturally to a beautiful silver-gray color. You will first construct the leg assemblies for the bench and then you will add the top slats. Beveling the exposed edges of the bench is optional. To begin the leg assembly, lay two of the 2 x 4 cross braces parallel to each other and about 15 inches apart. At right angles, over these cross braces, place the two 2 x 4 legs flush with the cross brace ends. Then set two more cross braces on top of the legs, exactly over the first two cross braces, sandwiching the legs in between. Use the carpenter's square to align and square up the pieces and then carefully clamp them together with the C clamps. Drill two diagonal 1/4" holes at each joint, all the way through the three boards. Insert a 5 1/2" x 1/4" carriage bolt through each hole, securing it with a washer and nut. Tighten with an adjustable wrench. Remove the clamps. Follow this exact procedure to build the second leg assembly, making sure the bottom cross braces are placed at the exact same height as the first leg assembly. Now install the 2 x 4 bench stretcher between the two leg assemblies. First, mark the center point of each cross brace on the outside bottom. Then mark the center of the bench stretcher board width at each end of the board. With the leg assembly in an upright position, place one end of the bench stretcher over the bottom cross braces, flush with the outside board. Line up the center marks and clamp together. Drill two 1/4" holes through each end of the stretcher and through the two bottom cross braces. Each stretcher end should have a total of four holes. Insert the same size carriage bolts used for the leg assemblies through the holes and tighten the washers and nuts with the wrench. Repeat to attach the second leg assembly. Set the 2 x 6 top slats across the top of the two leg assemblies and align the boards with a half-inch space between them. Clamp them securely in place. Drill four 7/64" holes in each 2 x 6 end and into the upper cross braces, at a total depth of about three inches. Then redrill the holes with a 7/32" bit, going only 1 1/2 inches through. Secure top slats with #12 x 3" flathead brass wood screws in each hole, making sure the screw heads are flush with the surface of the board. You can finish off the picnic table bench by beveling each exposed edge using a block plane. You can round the edges using a fine grit belt sander or by hand. 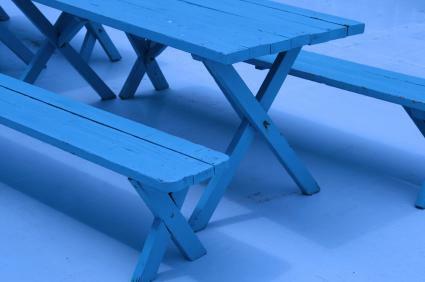 Building picnic table benches is a good do-it-yourself project for the beginner craftsman. It could also be a fun weekend project to do with your kids.